Is it a rip off? "My dad was a mail carrier…"
With Fireflies, Owl City scored a number one, worldwide acclaim and a rather sizeable comparison to The Postal Service (Death Cab For Cutie's Ben Gibbard's electronica outfit) - see the many cries of 'rip off!' from fans of the latter, and bystanders innocently questioning whether Owl City is, in fact, the same guy. It's not. 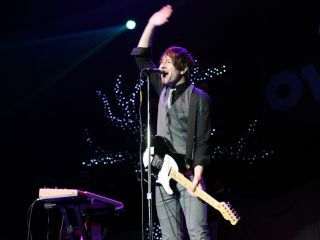 Owl City is Adam Young - the Minnesotan bedroom producer-turned-electro-pop starlet who, while admitting to being a Death Cab fan (via EW), claimed he never really 'got into' The Postal Service until after the comparisons were made. MusicRadar: I have to ask about the early slamming you got from some critics, especially Pitchfork, comparing you to The Postal Service. Unfair? Do you hear why they might lump you together? Are you totally sick of the comparisons and wish people could just move on? "Owl City: My dad totally used to be a mail carrier and he got to drive around one of those sweet trucks with the steering wheel on the wrong side." Sounds like Adam is a bit sick of this particular line of questioning so we'll leave him be and get back to talking gear. Check back tomorrow for the full interview.